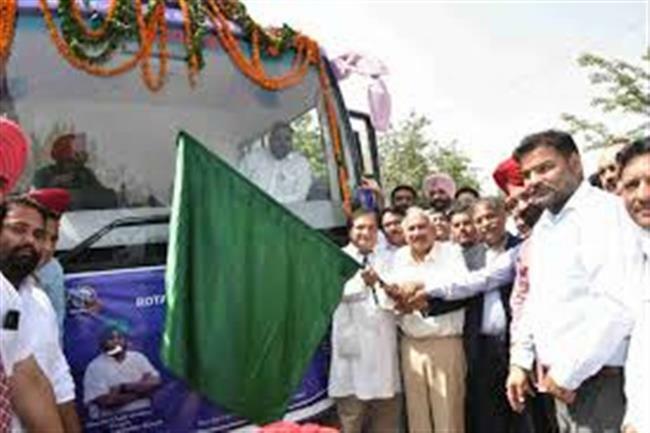 Chandigarh, June 21, 2018: Health and Family Welfare Minister Brahm Mohindra on Thursday flagged off an advanced cancer detection mobile van fitted with latest screening facilities to provide world class preventive medical care to women in Malwa region for early detection of the symptoms of deadly disease. Flagging off the van from the official residence of the Chief Minister Captain Amarinder Singh here this afternoon, he emphasised that the identification of the disease at the onset was vital to combat it besides ensuring the high survival rate. Cancer is the second leading cause of deaths after cardiovascular diseases and its increasing incidences only underscore the urgent need to focus on primary prevention by screening through Mamography and Pap Smear tests among women, he further added. Stressing on the need to proactively encourage and motivate women to register for preventive medical checkups, Brahm Mohindra pointed out that reluctance of women in rural areas at times leads to late detection which proves fatal. "This van has been launched to especially cater to those women at their doorstep," added the minister. The cancer incidence in four Malwa districts of Punjab including Sri Muktsar Sahib, Mansa, Bhatinda and Ferozpur is 107 persons after every one lakh population. Homi Bhabha Cancer Super Specialty Hospital at Sangrur and Advanced Cancer treatment and Research Center at Bathinda equipped with the latest diagnostic and curative facilities including Radiotherapy with Cobalt and Brachytherapy were serving hundreds of patients every year, he informed. The Health Minister said that Bhabha Atomic Research Center in collaboration with Tata Memorial Cancer Research Centre. Mumbai is setting up a 300 bedded Cancer Treatment Centre at New Chandigarh. 100 free detection camps for women for breast and cervical cancer will be conducted through the mobile van. who would be examined for suspicion of breast and cervical cancer. A radiologist and oncologist will travel with the van and after screening suspected cases will be referred to medical college for further examination and treatment, and in case of detection of cancer at early stage, cure can be achieved with use of lesser resources and lesser economic burden on affected families.